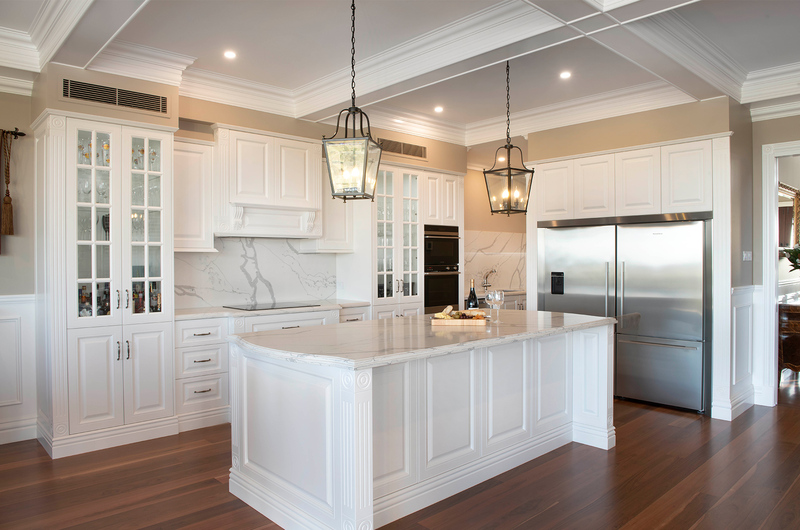 Special Note: The Housing Industry Association (HIA) has recently awarded Chateau Hunter Valley as winner of the 2018 HIA-CSR Hunter Housing Awards – Custom Built Home ($800,001-$1,000,000 category). Congratulations to Luxe Home Designs and Décor and builder Lance Murray Quality Homes! Inspired by the classic French provincial after traveling overseas, Luxe Home Designs and Décor designer Mimi Summers and her husband engaged a local multi award winning master builder to build Chateau Hunter Valley, their home away from the city and right in the heart of the wine country. “Our design vision was to create a home that encapsulates grandeur whilst retaining warmth, character, charm, elegance and the ability to blend seamlessly into the nearby tranquil hills and mountains,” said Mimi. The home presents a Classic French Provincial kitchen design with opulently detailed cabinetry featuring glass-fronted display doors, sophisticated tapware and ornate handles. 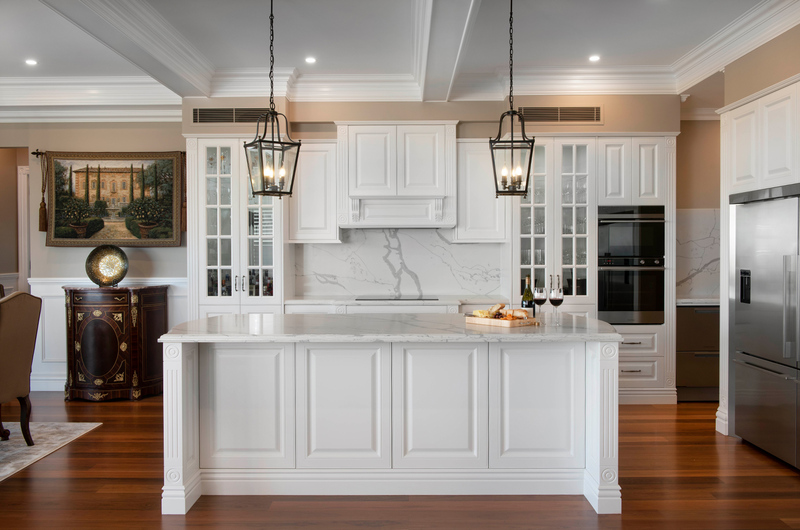 The heart of the kitchen is a 2700 x 1300mm contoured island bench in Smartstone Statuario Venato, showcasing a custom 40mm Classic French Provincial Dupont with offset Pencil edge profile which has also been featured throughout the kitchen. 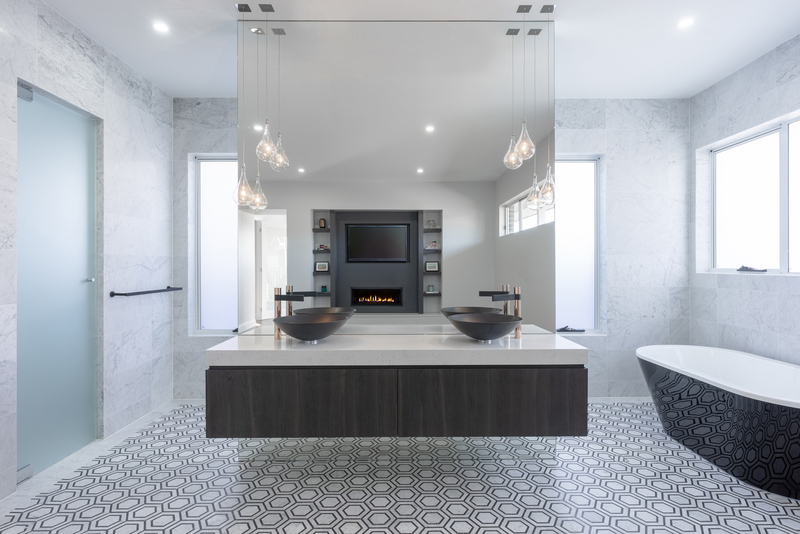 “We chose Smartstone Statuario Venato as it perfectly provides the sublime beauty and elegance of natural stone, and is incredibly durable and resistant to stains, chemicals and of course heat – in other words, it is wonderfully simple to maintain. The 3D depth of the dramatic grey veins coursing through the slabs is visually stunning,” Mimi said. The elegantly curved bump-outs on both the cooktop and sink benchtop areas provide additional character and depth to the kitchen symmetry. All splashbacks have been carefully book-matched and provide a uniform flow throughout the kitchen and butler’s pantry. 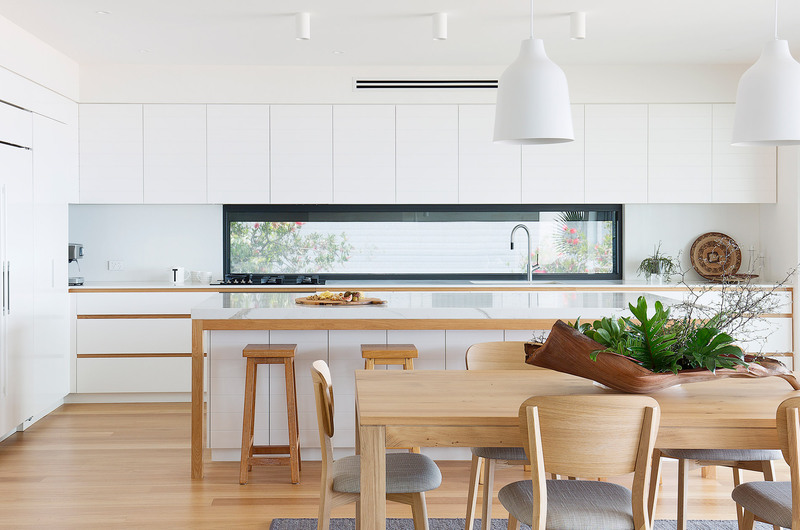 While this kitchen design harks back to an earlier time, it has been incorporated with modern appliances such as double ovens, induction cooktop and under-bench wine fridge which have been seamlessly blended into the space complementing the aesthetics and functionalities. 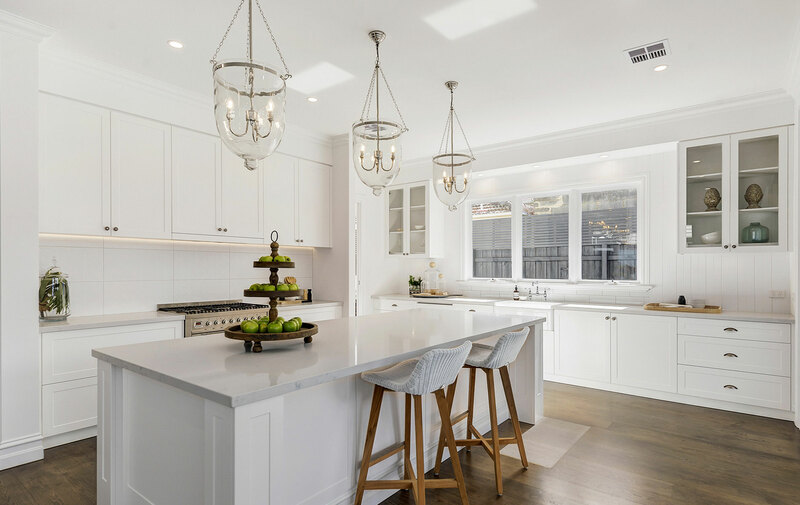 Large double stainless steel refrigerators have been custom framed into the white coloured cabinetry providing a clear statement and contrast. 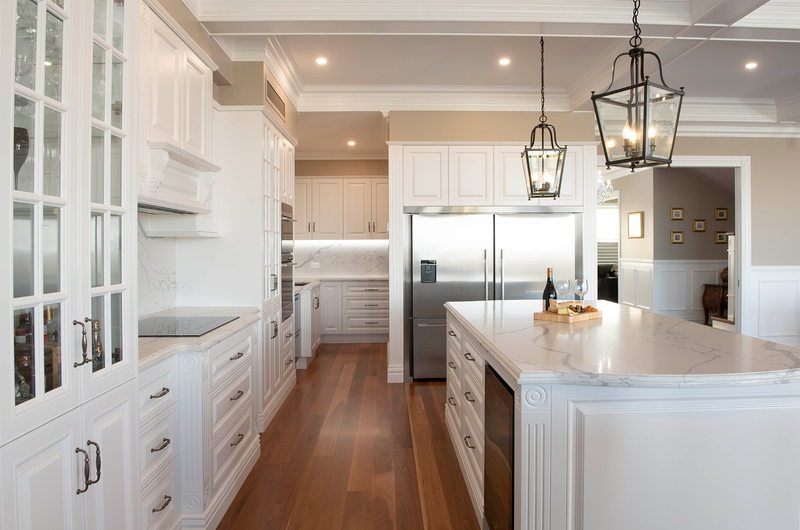 The butler’s pantry includes an oversize kitchen sink in addition to a stainless steel dishwasher to ensure minimal interruption to the flow and presentation of the kitchen when the home is being used for entertaining. In fact, it is that perfect balance of old and new that signifies a contemporary provincial design. The bedroom’s walk in robe centrepiece in Statuario Venato is a 1600 x 860 design replication of the kitchen island providing the space with added levels of sophistication. A total 5 Statuario Venato slabs were utilised for the project.